Only the Iveco Dealer network is able to maintain your vehicle for optimum performance at all times. 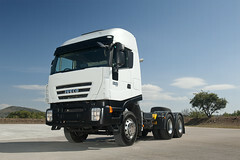 For this reason, Origin 100% Iveco has been marketed to re-enforce our commitment to our customers. Products and services of excellent quality, care and professionalism: Iveco Customer Service fulfills all expectations of the client with competence and dedication, maintaining the vehicle in perfect shape over time as it can only do those who have designed and built. Customer Services Iveco: discover all the After Sales Service. Flow Origin: 100% customer satisfaction.